Control focus from either side of the camera with Tilta's FF-T04-V2 Dual-Sided Follow Focus Kit. Stored in a hard case with custom-cut foam, this follow focus includes accessory fittings to work in nearly any situation requiring a follow focus. In addition to three different-sized 0.8 MOD drive gears, 0.5 and 0.6 MOD drive gears are also included for ENG lens compatibility. 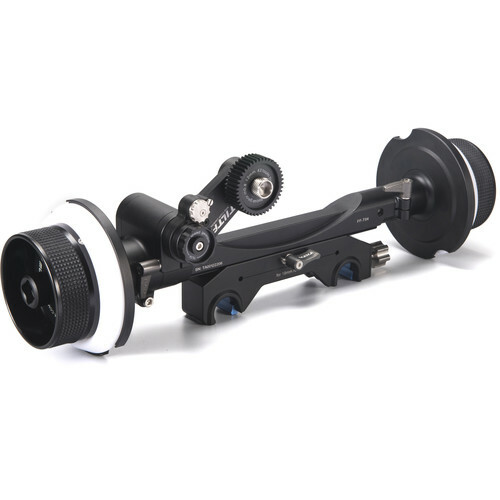 The follow focus unit itself has a swing arm for easy gear placement. Both focus knobs accept ARRI standard accessories, so whips and cranks can be attached at either side. If a slight extension is required to make room for large lenses, matte boxes, or other accessories, a hand wheel extension is included and attaches between the hand wheel and the follow focus unit itself. Interchangeable 15mm LWS and 19mm studio rod clamps provide scalability for use with small DSLR rigs up to a cinema studio zoom setup. Both clamps share a quick release design, so the follow focus can be installed and removed from the rods without disrupting other rod-mounted accessories. To complete the package, a 14" focus whip and speed crank are included, along with four marking disks and five zip gears for lenses without gearing. Box Dimensions (LxWxH) 17.6 x 15.9 x 7.2"